With the surge in technological advancements, there have been tons of things to discuss. The development of blockchain, cryptocurrencies, online and wireless communications gave a natural boost to the improvement of financial technologies. We have changed in the way we treat finances, conduct transactions and the tech we use for that. While the industry is much more advanced now than at the start of the 2010s, there still an infinite room for improvement. Such a vast field of possible activity attracts enthusiasts and significant investments. The buzz is in the air, and nothing is surprising about this fact. Let's try to dig a bit deeper and find cold facts to see the background of the attention to fintech. And this is by no means a vague forecast that may or may not be correct. FinTech IS at the center of the known universe when it comes to money and ways to reach perfection in cost-effectiveness. The numbers say it all - both newcomers and market giants are interested in funding their fintech ventures or investing in an outside startup that offers new technology. 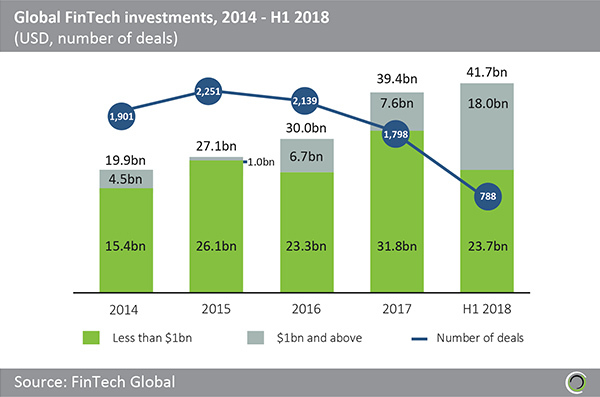 FinTech Global monitors the situation and, according to their research, the investments in fintech worldwide in 2017 have doubled the numbers of 2014. H1 2018 has moved even beyond that point with investments in the industry reaching $41.7 billion. Only the first half of the last year was more prolific investment-wise that the whole year before. As we’re writing this, H2 2018 reports are not released yet, but given the activity in the field, it is safe to assume that the figures will grow massively. Bright-minded individuals and visionaries create new solutions. Investors pour money to build on that. More talent is attracted to the pool of money and opportunities. New technology emerges, and new investments follow. ...there is more to see and discover. When the mobile banking rose from the ground, blockchain offered a new level of transaction speed, ledgers, and security. When banks splashed the cash on security and two-factor authorization, biometrics emerged. Big Data and chatbots take a chunk of work from analysts and support centers while enhancing managerial capabilities of the companies. Fintech evolved from cybersecurity and asset management into a vast field where every relevant idea can find its rightful place. This broadens the range of sourcing the talent on personal or company levels and increases the importance and interest in financial technology to the point when you are reading this paragraph. We have emphasized on this multiple times in our articles and will do it again. Banking and finances turned by 180 degrees for the last decade. A conservative invite-only club transformed into a thriving platform where the communication is at its peak, and everyone with an idea and knowledge is welcome. Not only the large fish is uninterested in fighting fintech enthusiasts and all their projects, but it also realized the need to fund those startups. The banking industry is now surrounded by accelerator programs, sponsorship initiatives and innovation events (meetups, hackathons, etc.) to attract and reap the benefits that the fintech startups are capable of producing. Investment figures above highlight the positive changes in the market and strengthen the feeling that industry giants won’t miss event a half-decent idea. Statista compiled a report on the number of fintech companies by region as of 2018. Legacy banking is falling into the abyss. Innovation is the only way to stay on top of things and dictate the market rules instead of mindlessly following them, completing a scripted “do or die” scenario. Who needs visiting banks and operate in cash with mobile applications and online banking? Why wait for days to complete a transaction if the benefits of fintech guarantee the same result in a couple of seconds? By saying that fintech is hot right now, we mean it has heated to a level when it melts a cold metal of old banking effortlessly. By continually coming up with better solutions for existing issues (security, authentication, transactions, user experience), fintech startups switched the play, and now big sharks have to catch up to stay alive. As one is following the fintech news feed, the broadening tendencies become apparent. The software and hardware engineering are the backbones of the industry. With the influx of new technologies, a need for proper management and sales representation arose. Today we're talking about such complex and sometimes vague concepts as mindset engineering when it comes to employees and transparency when thinking about the managerial staff. The third part of the equation is the customers. Their demands force the industry to focus on user experience and marketing heavily. This triangle has gained significant weight over the last years and is now expanding fintech career opportunities for those who don't code or tinker with hardware. Do you see the collective image now? We have received an industry that appreciates both hard and soft skills, finding a place for both in the system. With another massive layer of people who can help startups evolve mentally and on internal processes level, the financial technology industry is now a thriving ecosystem that incorporates people with drastically different skill sets and ideas — a new Candyland for those seeking career growth, personal development, monetary gains or recognition. While cryptocurrency or advanced robotics may not be a part of an average citizen's life, finances are something that will remain there for the foreseeable future. Loans, real estate, contract management, deposits, transactions - all of those and more shape the economy as we know it. The financial sector is the Sun in this system, and fintech is bound to be its new, enhanced, core. The advancements in fintech seem far more tangible for everyone than the same things in bioengineering. The massive scale of the industry and the need of banking players to evolve speed up the transition process between a concept and full-scale implementation. Meaning as much as we want new ways to enhance our energy output or health strength, financial technology is far closer to the masses. This yet again directs us into the field of buzz from the community, only encouraging the fintech development further. The fintech is disrupting the legacy financial industry internally and externally. Starting as a group of enthusiasts interested in simplifying and innovating, it grew to a multi-billion dollar industry that increases exponentially and lets others grow with it. The vast unexplored potential lies in front of anyone willing to experiment and adopt new ideas, causing a huge gold rush both from investors and enthusiasts. The list of available technologies grows as well as the ways to improve upon them, discovering even better cost-effective alternatives. The investors are not afraid to fund fintech anymore, as its benefits are clear as day. As the source of innovation, the startups also focus heavily on mindset and mentality, spice it up with enhanced UX and profound marketing efforts, attracting specialists that are miles away from anything related to software or hardware. Fintech became a massive force to be reckoned with, and that’s the level of “hot” that deserves admiration and respect.